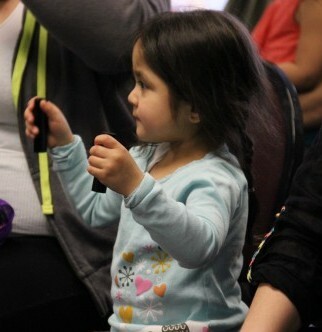 Tulalip – Tulalip Youth Services hosts a culture night every Monday at 5:30 p.m. The evening often features lessons on traditional arts and crafts and always includes time for singing and dancing. Some nights, like March 24th, the cultural specialists, Tenika Fryberg and Taylor Henry, prepare an evening of culture and community through games and other presentation. On the 24th, they presented the traditional slehal game. Slehal, translated as bone game or also referred to as stick game, is a traditional game that is played throughout the Salishan area, from Northern Oregon up to Haida Gwaii and as far east as Browning Montana. The goal is to win all of the stick by finding the unmarked bone, much like the children’s game ‘pick a hand.’ The number of sticks varies between seven and eleven, but the goal remains the same. Bone Games mean many things for Salish peoples. There are origin stories about men playing against the animals to determine who will rule the world. This embodies two specific aspects of slehal, gambling and dispute settlement. Historically, slehal was a means to settle disputes. Whoever won the game, won the argument. Traditionally, slehal was a gamble, and still is today with many tournaments for prize money up to $10,000 cash. Culture night is a chance to enjoy these aspects of our culture, coming together as a community to teach all people about our traditions. It is a place to learn the songs and the dances, and, like this week, the communal traditions. Culture Night is held every Monday in the portable across from the old tribal center, now the youth center, at 6700 Totem Beach Rd. For more information contact Taylor Henry at (360) 716-4916. This entry was posted in Arts & Entertainment, Education, Tulalip News and tagged Bone Games, Slehal, Tulalip Tribes Culture Night by admin. Bookmark the permalink.